For years, a passerby could identify the Brooklyn recycling center Sure We Can by sound alone — the soft tinkling of cans and bottles collected from the city streets and the boisterous voices of the people who collected them. But for much of 2016, the non-profit sorting spot and de facto community center in Bushwick may have been just as identifiable by smell. In the back of the lot, behind the walls of Coca-Cola cans and vibrant murals by local artists, was a big, brown, 10-foot pile of organic waste, steaming and sweating even in the chill of early winter. The pile of compost had been building for over a year. 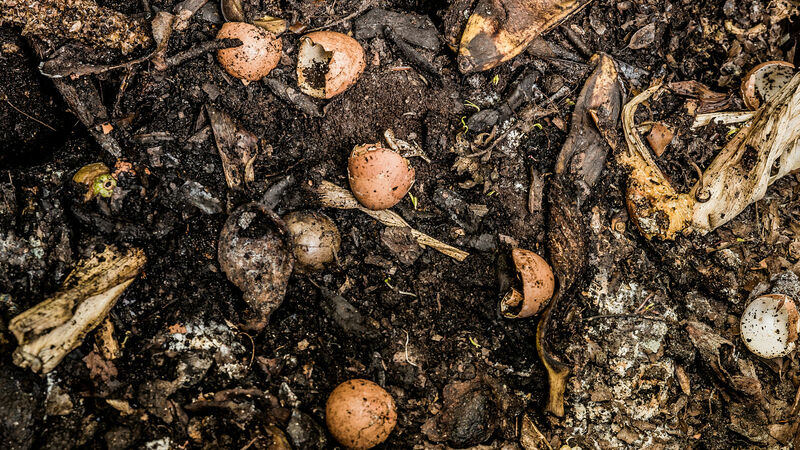 After decades in which composting in New York was mostly done by a small number of self-described “compost nerds,” local interest in composting is now growing fast. In 2015, about 31 percent of the more than two billion pounds of organic waste produced in the city was composted. That number still lags composting totals in many other large cities, but according to the New York City Department of Sanitation, it is going to grow. The agency expanded its curbside pickup program for food scraps to include more neighborhoods and is working with a growing network of drop-off community composting centers like Sure We Can to process local waste. But as demand for organic waste collection has grown, the demand for the final product — the soil produced by composting — hasn’t kept up. At Sure We Can, co-founder Eugene Gadsden manages the 50 tons of food scraps the group collects each year from local restaurants and coffee shops. He wasn’t always interested in composting — until he saw what it could do. “One day I looked around and saw the food was gone,” says Gadsden. Decomposed. But what should be an ephemeral process — the whole point of composting is that trash eventually disappears — turned into a long-term burden for Gadsden. The pile at Sure We Can, at a time almost twice Gadsden’s height, included layers more than a year and a half old. To really sell it, he says, he would need more money, more time and more helping hands. The only thing he isn’t lacking is more waste to process. “That’s because of a seasonal mismatch,” says Lower East Side Ecology Center founder Christine Datz-Romero. “While people throw away food scraps year-round, they only want compost in the springtime when they’re planting new seeds.” Demand spikes in April and May but by midsummer the compost market almost completely disappears. “You basically have a very small window of opportunity to really sell materials to people. Out of a whole year, you have three strong months,” says Datz-Romero, a leader among New York City’s compost nerds”for over 30 years. “The soil may be sold eventually, but for the nine or so months a year when sales decline, organizations like Sure We Can struggle to find room for their compost piles until the next buying season,” she says. BK ROT, another Bushwick-based community composting operation, has managed to sell much of the compost it creates during the off-season, but usually at a dirt-cheap price. Sandy Nurse, BK ROT’s founder, has created a mini-market with other nonprofits and schools that need new soil. But she sells her dirt at market value, which is a minuscule $0.007 a pound. Some organizations are willing to pay more, but they are rare, and don’t realize that making rotting dirt is hard work. “In terms of marketing compost, you have to communicate to people there is a lot of time involved and a lot of effort,” Datz-Romero says. “That’s an issue of perception with people.” Last winter, BK ROT began negotiations with some Brooklyn boutiques that sell succulents and cacti; Nurse hopes they will pay $1 per pound and market their product as artisanal soil in a way only Brooklynites can. The city sanitation department acknowledges local groups have had trouble selling their soil, but has offered no solutions. “We’ve heard the same thing [about soil sales] from the community composters out there,” says Bridget Anderson, Deputy Commissioner of the department’s Bureau of Recycling and Sustainability. She says these kind of challenges are expected for groups operating at such small scales. As a result, Sure We Can and other groups must continue to think locally, selling small amounts to city dwellers who only plant a few tomatoes or fresh flowers every spring. But even these small-scale buyers can balk at the price, especially if they don’t understand that making compost requires time, space, transportation, labor, expertise and considerable expense. New York’s hybrid system of community recycling centers and partial curbside pickup is likely to soon evolve to a government-dominated system. The sanitation department is scheduled to expand curbside collection in all neighborhoods by 2018. That will be a game changer, not only because the city will assume responsibility for collecting food scraps for all New Yorkers, but also because the sanitation department will have the funds to haul the scraps to huge compost processors far from of town. The city often ends up using its massive parks system as places to dump all of the finished compost it cannot sell. In moving to a public composting system, New York City will be emulating other North American cities that are much more aggressive composters, including Seattle, Austin, Vancouver and Toronto, all of which have had great success with their city-run composting efforts for years. Officials in those cities attribute their triumphs to the fact that their programs are mandatory – everyone must separate and save their food scraps for city pickup. That’s unlike New York City, where composting is strictly voluntary – at least for now. Many of those other cities put compost bins not just in homes and apartments, but also on streets, in schools and even in private work spaces. Even though the most successful composting programs tend to be run by local governments, many of those city’s composting initiatives have managed to find ways to maintain the community values that are the heritage of composting. Austin’s food scraps, for example, are hauled to Organics by Gosh, a family-run processor just a few miles from downtown. That’s important to people at Sure We Can and BK ROT, who worry that the New York Department of Sanitation’s expansion plans will cripple the grassroots environmental values they represent. At Sure We Can, the leaning tower of soil finally started being deconstructed around Christmas. Gadsden and other volunteers began bagging the material for sale. For a while, the idea was to convince Whole Foods Market in Brooklyn to sell the homemade soil, but months of conversation hadn’t borne fruit. Instead, Sure We Can listed the compost on its own website and hopes locals looking for small orders of fresh soil will find them and place an order. Fortunately, spring seems to coming early this year and, with it, peak demand for compost. Great article, Eleanor!. . .Eugene and I re-read it today in preparation for a visit of Sanitation to Sure We Can.You describe so well the main problems and open avenues for possibilities, that we find this article so enlightening, even for us who smell compost every day! THANKS!! !